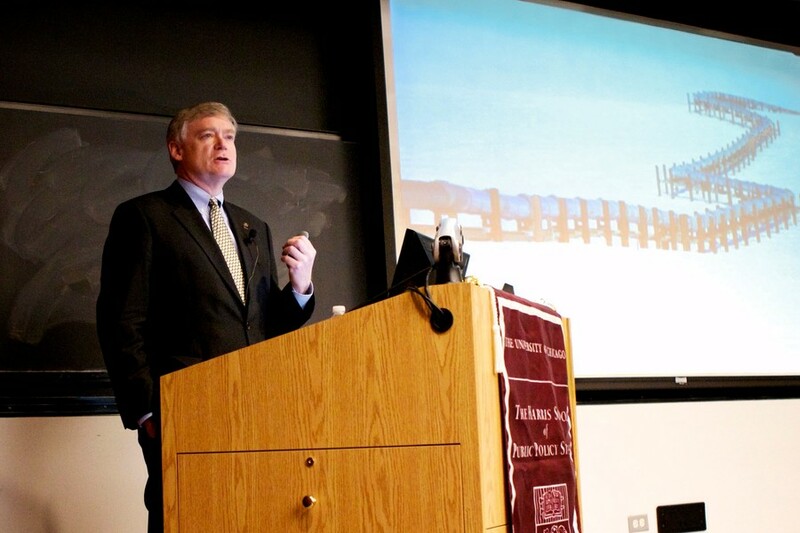 Alaska’s Lieutenant Governor Mead Treadwell defended his state’s desire to drill for oil on federal land within its borders, emphasizing the importance of arctic energy to America’s national interests at a talk Wednesday night at the Harris School for Public Policy. Treadwell started off his speech with a history lesson, hoping to put Alaska’s value to the rest of the country in perspective. Treadwell called on Washington to allow the state government to exploit the natural resources that lie untapped on federal land. “We want to safely explore areas like the intercontinental shelf, the National Petroleum Reserve-Alaska, the Arctic National Wildlife Refuge, and some of the foothill areas that all are on federal land. In order to get access to federal land’ we have to get the votes in Congress,” he said. Inevitably, the issue of environmental conservation arose. Treadwell defended oil exploration from charges of ecological harm, claiming that advances in extraction techniques and technology would minimize the damage. Alaska is also an abundant source of renewable energy, Treadwell said, which the state has been aggressively trying to develop. “We’ve established a goal of, by 2025, having 50 percent or more of the energy use in the state come from renewable energy sources. And frankly, we’d like to go more,” he said. Treadwell also found a silver lining in global warming, explaining that the recession of ice in the Northwest Passage may open up valuable shipping routes to East Asia and Russia. Treadwell’s talk was sponsored by the University of Chicago Rotary Club.